Climbed on skis March 24. 2005. 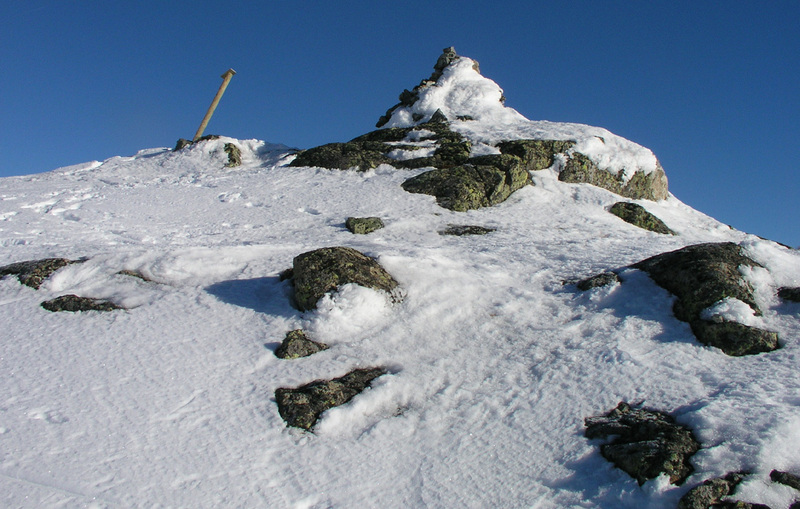 How to get there: This peak can be accessed starting from Etnedal as well as from Gausdal. In summer, the road connecting Vestre Gausdal with Fagernes (in Valdres) provides a close and convenient starting point. This road is closed in winter. From the Vestre Gausdal side, the road is open to Verskei where there is parking, this is a good trailhead in winter. See the description below. 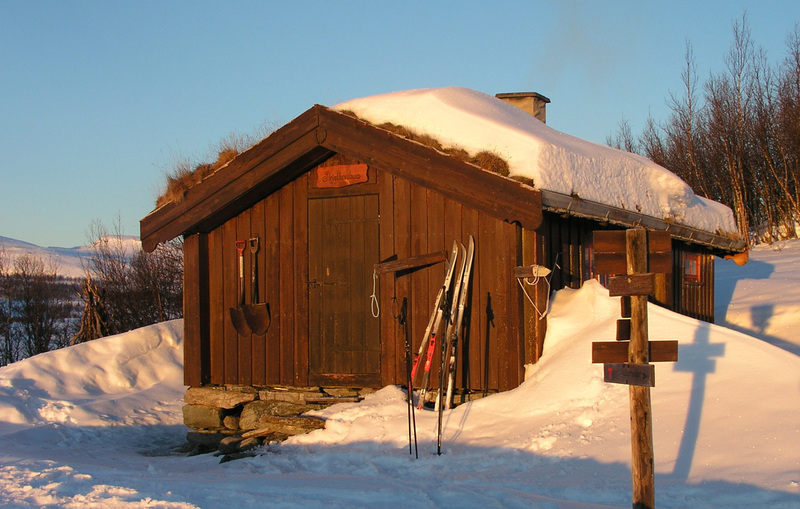 In this route description, we skied from our hut at Åltjern. Compared to starting at Verskei this adds 15 kilometer (each way) to the trip. Route description: From my hut, the first part of the route is skiing to Verskei. In Easter, there is a good ski track, earlier in winter one may have to break trail. Verskei is about 15 km from Åltjern. 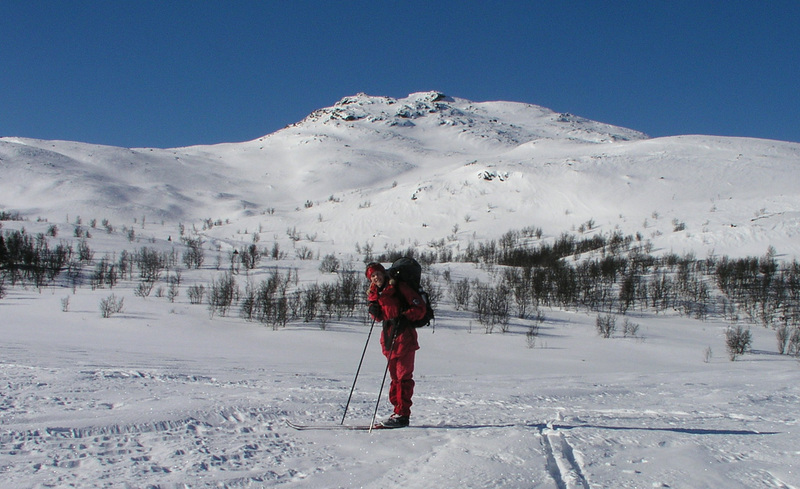 One can either ski a fairly flat route across meadows and lakes or a bit more hilly across the Skjellbreidfjellet mountains. Either way, passing Nyseter about 5 kilometer before Verskei. From Verskei, continue along the snowed in road down to Kittelbu and further west to Holsbru. Holsbru is the lowest point on the trip, here the river Dokka is crossed at elevation 768 meter, north 61:10.724, east 009:52.269. From Holsbru, continue a short section uphill along the road, then take the small road (still snowed in) that forks right to Ormtjernsetra. Here, you enter Norway's smallest national park, Ormtjernkampen, named after the mountain up on your right side. This national park is known for some of Norway's highest growing spruce forest (up to almost 1100 meter), this forest is also well preserved, in the sense of being unaffected by the forest industry. Soon, you come to the old Ormtjernseter buildings, elevation 847 meter, north 61:10.991, east 009:49.142. Continue along the road as it climbs and passes just south of Snærneskampen (1088m). From here, the lake Skjellbreida (999m), is about 8 kilometer straight west. Cross the valley and proceed west. In winter, if trail breaking is cumbersome (deep snow and birch trees), it may be best to climb above the treeline on the north slopes of the mountains on your left. Continue to lake Skjellbreida, there is a self serve hut at the north-east end of the lake. This hut, Skjellbreidbu, is located at elevation 1011 meter, north 61:10.734, east 009:38.417. The hut is open, it is a good place to stay overnight. Basic pots and pans, firewood, etc. is provided. You should pay a (voluntary) contribution to help keep this excellent hut system running upon return from your hike. The goal, Djuptjernkampen is now just a few kilometer due south of the lake. In winter, it is best to cross the lake and ski up west of the summit. There is good skiing all the way to the relatively small summit area. 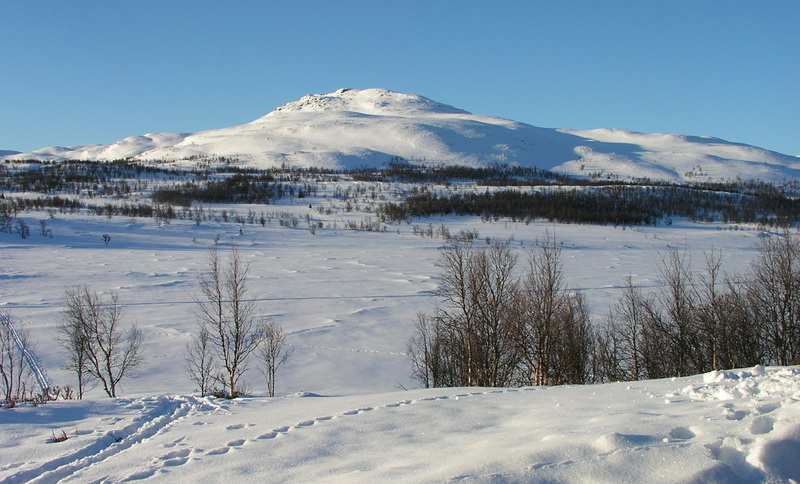 This peak has a very good 360 degree view, in particular to Jotunheimen (north) and Rondane (north-east). Comments: I did this climb with my son Pål Jørgen, age 16. This is a pretty serious trip when starting from our mountain cabin at Åltjern. 40 km of cross country skiing in order to reach the self-serve hut Skjellbreidbu. The last 10-15 kilometer is hardly ever skied and one should be prepared for breaking trail. 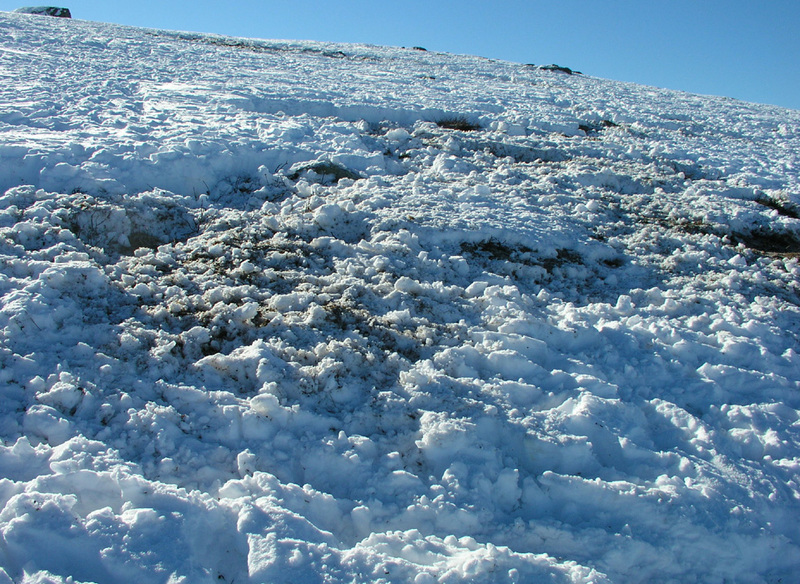 On this trip, in March, a recent heavy snowfall made trail breaking quite non trivial. The last 10 kilometer took us 4 hours. We arrived at Skjellbreidbu at 1645 after 8 hours of skiing. We stayed at this hut until the enxt morning, started skiing at 0715 and reached the summit at 0930. The upper slopes of the mountain had recently been visited by what must have been several hundred reindeer. We enjoyed a perfect morning with a perfect view, Jotunheimen and Rondane being most spectacular. We left at 0945 and proceeded to the summit Ormtjernkampen, arriving there at 1300 after quite a struggle in deep snow at the lower elevations. We rested and rewaxed the skies at Holsbru, left there at 1445, arriving at Verskei at 1620. After a good rest there we skied at 1650, arriving home at Åltjern already at 1800, quite fast evening conditions. Altogether, 8 hours of skiing on day one, then 11 hours of skiing, including two nice peaks, on day two. Djuptjernkampen, as seen from the Skjellbreidbua hut. Skjellbreidbua, the self serve hut near Djuptjernkampen. Reindeer, have been feeding here. Two days earlier, this photo was taken by Thierry Matthew. Pål Jørgen in front of Djuptjernkampen on the way home. 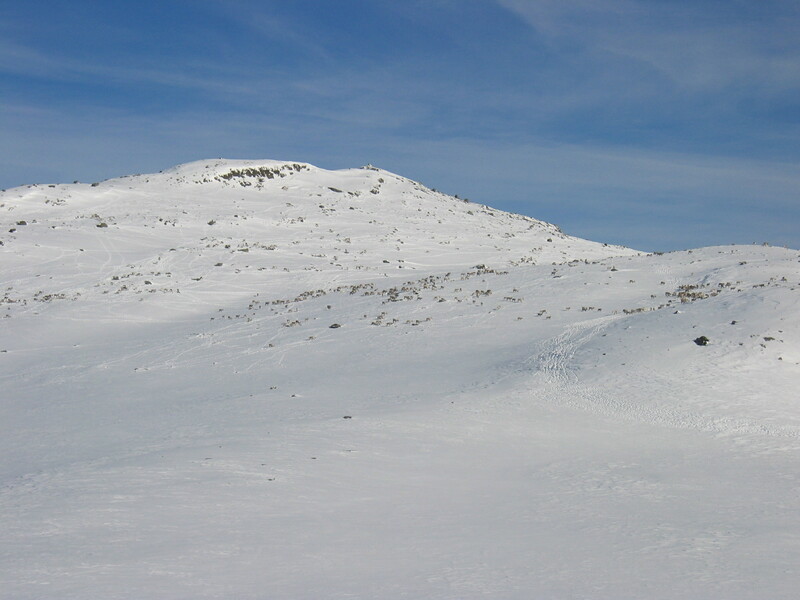 Summit panorama, the view south towards west, Synnfjellet is left. Summit panorama continues the view is west. Summit panorama continues the view is west to north. Summit panorama continued, the view is north. Summit panorama continued, the view is east. Detail from Jotunheimen, as seen from Djuptjernkampen.